Upcycle sweater - turorial Angora pullover conversion. 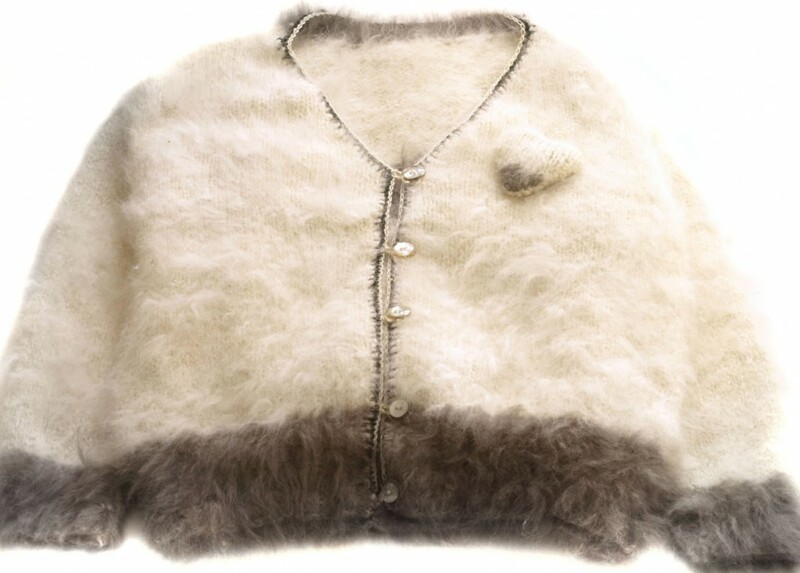 Today’s story – Upcycle sweater – Tutorial Here’s how it happened in real life to 2 warm and fluffy pullovers. They have been converted into cardigans – projects perfect for our chilly Southern Hemisphere weather right now. 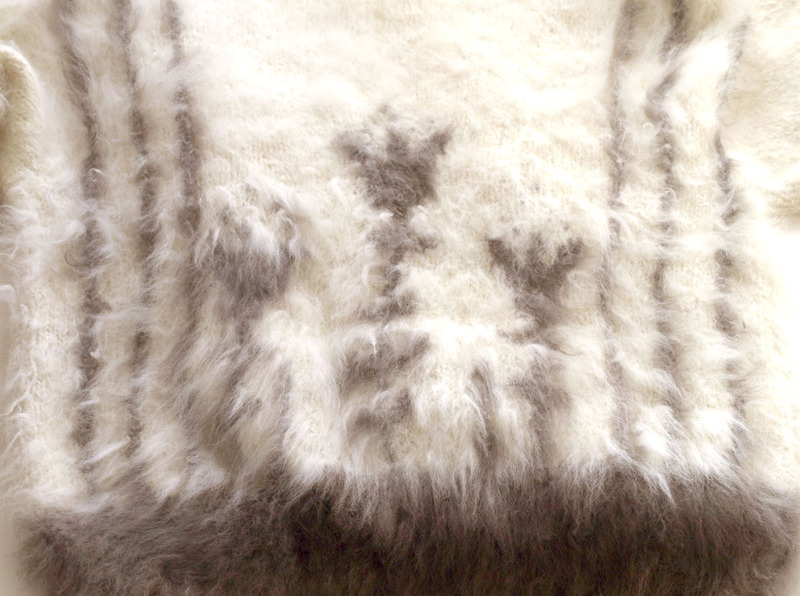 The first is family heirloom Angora Pullover. This gorgeous item was created by my client’s mom a number of years ago. Not only did she hand-knit the jersey, but she also hand spun the yarn from an Angora Rabbit that she kept herself. I believe that Angora is 6 times warmer than normal sheep’s wool, so Deborah found that it was too warm to wear all day in our mild Durban climate, and preferred to have the jersey as a cardigan that she could throw on for extra warmth when needed. The patterned front became the interesting back of the garment – and I made a little jersey heart from the area where the front neckline was cut out. The second was a pretty fluffy thrift shop find jersey that I converted for myself. Both of these were done in a similar way. 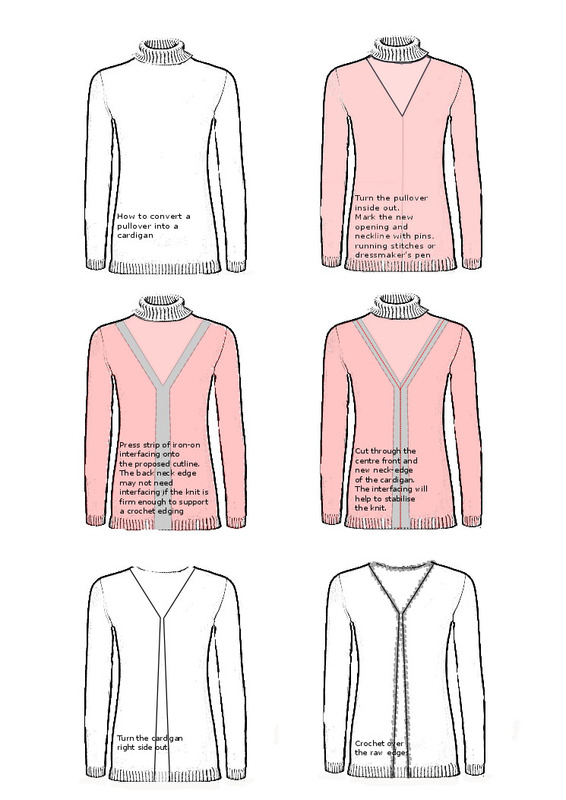 This is how you can create your own cardigan story. Each Pullover is different so you may have to adapt these instructions to best suit the one you have. 1. Find an old sweater, pullover or polo-neck jersey. 2. Turn the sweater or pullover inside out. Mark the new opening and neckline with pins, running stitches or dressmaker’s pen. 3. Press a y-shaped strip of iron-on interfacing onto the proposed cut line on the wrong side of the jersey. 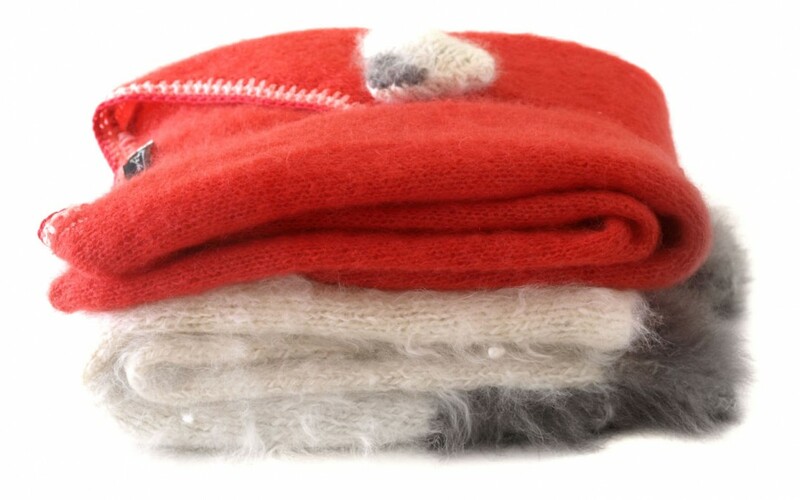 Use a damp press-cloth, so that the yarn is not damaged. 4. Cut through the centre front and new neck edge of the cardigan. The interfacing will help to stabilise the knit. Crochet over the raw edge. 6. Select an appropriate matching or contrasting wool or cotton, with an appropriately sized crochet hook. Put the crochet hook into the knitting, (deep enough away from the edge to not cause it to unravel). Put the yarn over the hook ,pull the hook back through the work to the front, keeping the yarn on the hook so that it forms a loop on the front side of the garment, make a second loop on the hook, and pull it through. 8. Keep going all the way around. It may take a few tries to get the spacing of the stitches correct. This row forms a base for the crochet edging. You may want to do a few plain rows of double-crochet. Button holes can be created in the crochet work, or chain button loops can be added afterwards. Please tell us about your cardigan conversion story. We’d love to know how it turns out. 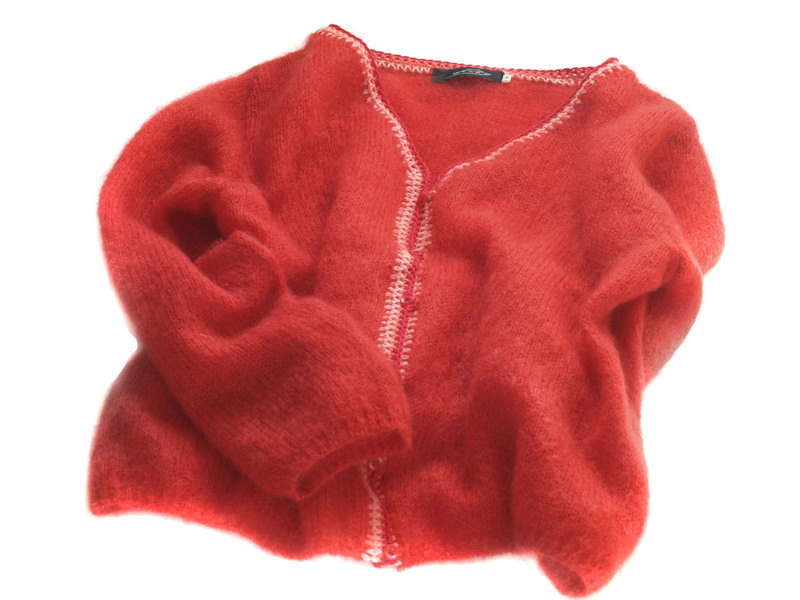 Interesting fact – A cardigan is a type of knitted garment that has an open front. Commonly cardigans have buttons. A more modern version of the garment has no buttons and hangs open by design. By contrast, a pullover does not open in front but must be “pulled over” the head to be worn. It may be machine- or hand-knitted.